Not all of the changes you see are related to Brutal Doom. Here, it's being tested on Freedoom, hence the different textures and assets. 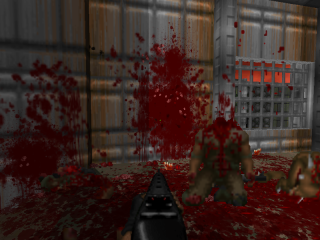 This new version of the Brutal Doom mod is being designed to be compatible with mods that use custom graphics. In the video you can see v20's new kill animations, and the extra zombie rotation sprites based on the assets John Romero tweeted during Doom's anniversary. This video's description also teases an official release date and trailer for v20, both of which should be arriving in the near future. For more, head over to Brutal Doom's ModDB page. I recently picked out some recommendations for other great Doom mods. Head here for them. *Please replace time and state of drabness according to current location.